Virginia Tech's Buzz Williams will be the new Texas A&M coach. Virginia Tech announced the news in an official press release on Wednesday that Williams is accepting the same position in College Station. 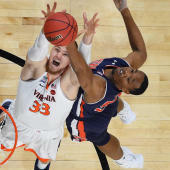 "Coach Williams made a very positive impact on the culture of our basketball program at Virginia Tech," Virginia Tech athletic director Whit Babcock said. "We appreciate all that Buzz and his staff did for our students and our program. We wish Buzz, Corey and their family the very best as they return to their home state of Texas. Multiple sources have told CBS Sports that Texas A&M, with the help of boosters, is prepared to pay Williams more money -- easily north of $3 million annually -- than it's ever paid a basketball coach in its history. This after being on the hook for approximately $5 million for Billy Kennedy and his staff, who were fired in March after eight seasons and two NCAA Tournament appearances. Texas A&M also gave football coach Jimbo Fisher a 10-year, $75 million contract in August after firing Kevin Sumlin. Williams had long been connected to the Texas A&M opening. The Lone Star State native spent the past five seasons at Virginia Tech, going 100-69 and taking the Hokies to three straight NCAA Tournaments for the first time in program history. Williams was previously at Marquette, where he spent six seasons and made five NCAA Tournaments. His career coaching record is 253-155.